layers Association (QPA) to establish collaboration in the field of sports activities. ecreation Activities at QU Student Activities Department Ms. Asmaa Al-Naemi and officials from QU and QPA. 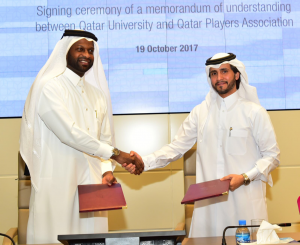 In the terms of the MoU, QU will provide QPA Academy with access to its stadium and facilities for training. QPA through QPA Academy will sponsor and provide the technical and administrative support as well as the necessary equipment and sport clothing to QU football teams.